Violation of the rights of indigenous peoples of Ukraine in the conditions of the Russian occupation of the Crimean peninsula were discussed in the UN. July 10, 2017 in Geneva Crimean Tatar Resource Center and Mejlis of the Crimean Tatar people organized a side event within the framework of the X session of the UN Expert Mechanism on the Rights of Indigenous Peoples. The event was devoted to violations of the rights of indigenous peoples of Ukraine in the conditions of the Russian occupation of Crimea, according to a member of the Mejlis of the Crimean Tatar people, Chairman of the Crimean Tatar Resource Center Eskender Bariev. Bariev greeted the participants of the event on behalf of the leader of the Crimean Tatar people Mustafa Dzhemilev and the Chairman of the Mejlis of the Crimean Tatar people Refat Chubarov, thanked the UN member states for supporting the UN Resolution on the Crimea of ​​December 19, 2016, the Committee of Ministers of the Council of Europe for the Decision on the Crimea of ​​May 3, 2017, as well as international human rights organizations for the support of the Crimean Tatar people. In his speech, Eskender Bariev outlined the actions of the occupation authorities, which grossly violate the articles of the UN Declaration on the Rights of Indigenous Peoples, the UN Universal Declaration of Human Rights and the Fourth Geneva Convention. He also informed about the idea of ​​the International Solidarity Movement with the Crimean Tatar people. Speaking at the session of the Expert Mechanism, Professor Boris Babin stressed the refusal of the Russian Federation to comply with the order of the International Court of Justice on the need to abolish the Mejlis ban. 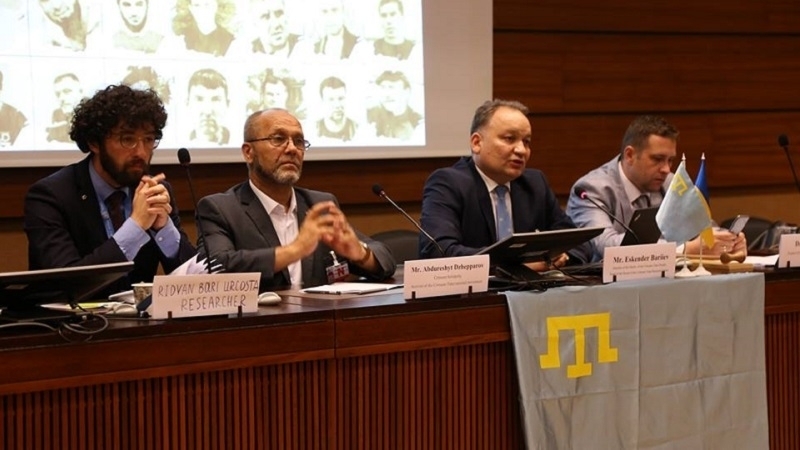 The activist of the Crimean Tatar National Movement, the coordinator of the "Crimean solidarity" Abdureshit Dzhepparov, whose son and nephew were forcibly abducted in September 2014, informed the participants about the missing and dead people during the occupation of the Crimea. Until now, nothing is known about the fate of these guys. Ridvan Bari Urkosta proposed to initiate the creation of a special rapporteur on the human rights situation of the Crimean Tatars in the UN system. Within the framework of the parallel event, a short film was shown about the violation of the rights of the Crimean Tatar people prepared by the television channel ATR and the Crimean Tatar Resource Center. The organizers of the event also presented an exhibition on the history and culture of the Crimean Tatar people, prepared by the Estonian Institute for Human Rights, the Ministry of Information Policy of Ukraine, the Crimean Tatar Resource Center with the support of the Ministry of Foreign Affairs of Estonia. The historian-consultant of this exhibition is Gulnara Abdullayeva. The exposition included portraits of political prisoners, as well as those missing and deceased during the occupation period. Furthermore, Ekskender Bariev said that on July 10, a meeting was held with the Third Secretary of Human Rights of the Permanent Mission of Estonia to the United Nations and other international organizations in Geneva, Mr. Merje Magi, and on July 11 member of the Crimean Tatar people's Mejlis, Chairman of the Board of the Crimean Tatar Resource Center Eskender Bariev and Professor Boris Babin held a meeting with the United Nations Special Rapporteur on Indigenous Issues, Mrs. Victoria Tauli-Corpus. Among other things, the issues of violent abductions and killings of indigenous peoples in the Crimea, illegal arrests, the unlawful prohibition of the Mejlis and the refusal of the Russian Federation to comply with the norms of the UN Declaration on the Rights of Indigenous Peoples were discussed. The Crimean Tatar researcher Ridvan Bari Urkosta took part in the meeting as well. On 11 July, a member of the Mejlis of the Crimean Tatar people, Chairman of the Board of the Crimean Tatar Resource Center, Eskender Bariev, met with the President of the UN Permanent Forum on Indigenous Issues, Mariam Wollet Abubakrine, she was informed of the abductions and killings of indigenous peoples in the Crimea, illegal arrests, illegal ban of Mejlis and refusal to respect the norms of the UN Declaration on the Rights of Indigenous Peoples. On July 12, a member of the Mejlis of the Crimean Tatar people, Chairman of the Board of the Crimean Tatar Resource Center Eskender Bariev met with Tuomas Aslak Juuso, Deputy Chairman of the Saami Parliament in Finland, to discuss the prospects for interparliamentary cooperation between the Saami Parliaments of Finland, Sweden, Norway and the Mejlis of the Crimean Tatar people. The lawyer Vyacheslav Lombroso also participated in the Expert Mechanism on the Rights of Indigenous Peoples. The Crimean Tatar Resource Center expressed gratitude to the Permanent Mission of Ukraine to the United Nations and other international organizations in Geneva, represented by the First Secretary Ms. Olga Kavun. The organization of a side event within the framework of the X session of the UN Expert Mechanism on the Rights of Indigenous Peoples was carried out with the support of the Renaissance International Foundation.